POMONA, Calif. (February 10, 2019) — Austin Prock earned his first career round win under gloomy conditions Sunday at the Lucas Oil NHRA Winternationals. 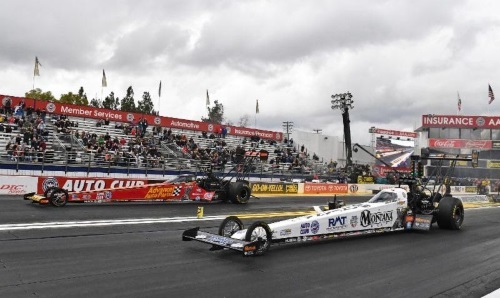 Prock defeated Brittany Force in the first round before weather suspended competition at Auto Club Raceway at Pomona. Racing is set to continue Monday, Feb. 11 at 10 a.m. with the conclusion of Top Fuel first round. Before the weather interfered with the day’s racing activity, six pairs of Top Fuel dragsters lined-up, including Austin Prock in his Montana Brand / Rocky Mountain Twist dragster against Brittany Force in her Advance Auto Parts dragster. It was a pedal fest for the John Force Racing teammates with Prock getting the better of the track. Prock would cross the finish line with a 4.029-second pass at 312.21 mph to top Force’s 5.851 at 112.72 to record his first professional NHRA career round win. Prock is on the verge of having the most successful debut of any John Force Racing team in history if he can manage a second-round win tomorrow morning. Only Courtney Force debuted with a first round win at the Winternationals in 2012 against Bob Tasca III but ended her day in the second round against Mike Neff. Prock and Force were the final pair of nitro cars to hit the track before NHRA officials made the decision to suspend racing. Prock will face the winner of the final Top Fuel pair of Mike Salinas and Clay Millican. 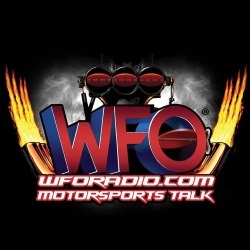 For those who subscribe to NHRA.TV, the remaining race coverage will be available.